Tai Chi Fan is a beautiful Anti-Aging exercise. The movement is elegant, graceful, and powerful all at same time. 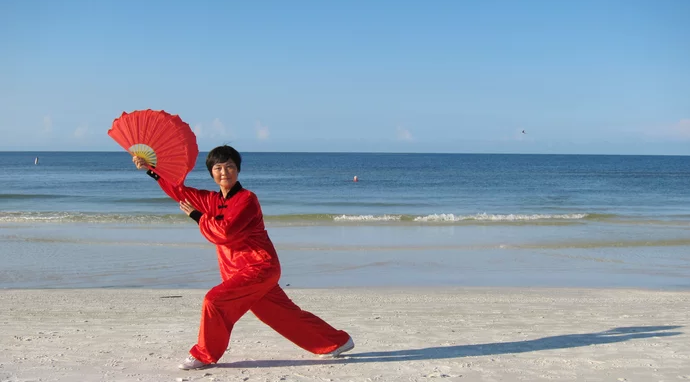 Performed with two fans, this Tai Chi form brings your health to the next level with improved posture, energy, flexibility, muscle tone, coordination, balance, physical and emotional stability, focus, discipline, physical stamina, and total relaxation. Tai Chi Fan is useful in preventing and assisting in the healing of arthritis, carpal tunnel syndrome, and preventing illness. This is an enjoyable exercise for all ages, especially for adults and seniors. A Tai Chi Fan performance is beautiful, elegant, graceful, and powerful all at same time. Previous Tai Chi knowledge is a plus but not a requirement, as long as you have patience and discipline. The red double fans can be purchased at the course for $30 per pair. There will also be some practice on the beach during the training.